Not so long ago, pets were not allowed in restaurants, markets and malls; only service animals such as guide dogs were ever seen at these locations. California law allows the disabled to bring trained service dogs and psychiatric service dogs to all public places. But now, “emotional service animals” are everywhere. Are that many more people in need of animal support or is something else going on? California and Federal law requires protection of disability rights, including use of trained service animals. In California, a “service dog” is trained to help a specific, disabled person with services such as guidance, protection, mobility assistance, fetching and similar tasks. The status is limited to dogs, although horses are allowed under the Americans With Disabilities Act, so they are allowed in California as well. The dogs must be trained to render particular disability support services. 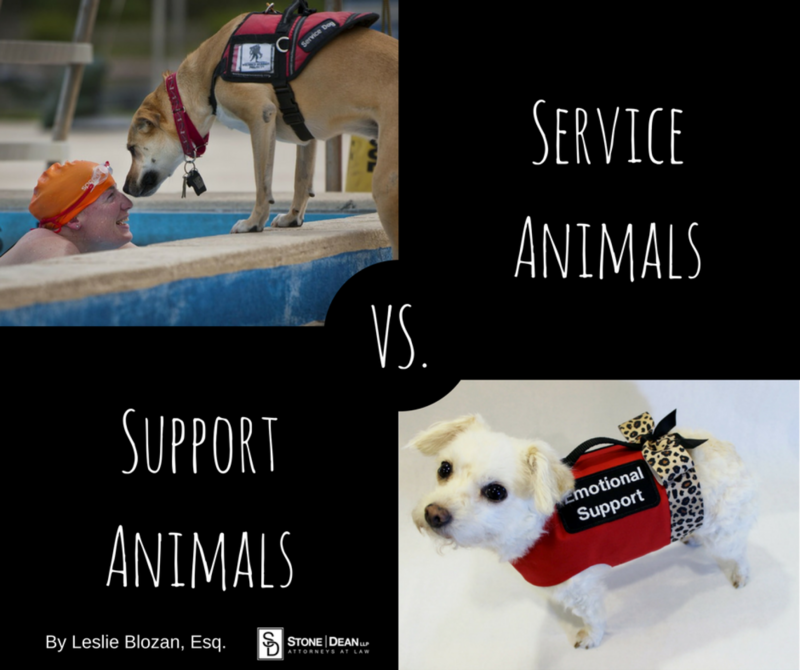 There is no separate definition for a psychiatric service dog. A dog individually trained to help a person with a mental or emotional disability can meet the standard requirements for a service dog, and a person using a trained dog has the same rights as a person with a service dog for physical disabilities. Emotional support animals, however, are something else entirely. These animal companions are not limited to dogs and they are not trained to perform specific acts directly relating to the human’s disability. According to a U.C. Davis study, the number of registered “emotional support animals” increased 1000% between 2002 and 2014. It turns out, having your little Fluffy registered as a support animal is a simple process through easily accessible websites. Any species can qualify, although the qualification itself is somewhat suspect. There are online sites that will register any pet for a fee, and provide documentation the animal is “certified” as an emotional support pet. Recently, as a test, a local Los Angeles radio station registered one of its interns as an emotional support animal. For actual pets, no training is offered and the animal will NOT qualify as a service animal under the ADA or state law. What work the dog is trained to do. No questions can be asked about the nature of the disability and no “proof” of any type can be required. Improper questioning can result in a discrimination lawsuit. Many legitimate service dogs wear vests or other visible identification to alert to public they are working, but identification and registration are not legally required. It is not unusual to encounter a tiny dog with a pastel “service dog” jacket that looks decidedly frivolous. Their owners may be disabled, may have a whimsical fashion sense, or their owners may be committing a crime. California Penal Code section 365.7 makes it a misdemeanor for a person to falsely represent him/herself to be the owner or trainer of a service dog. The penalty includes imprisonment in county jail for a period not exceeding 6 months, and/or a fine not exceeding $1,000. So why are there so many emotional service animals allowed on airplanes? The Federal Air Carrier Access Act allows “emotionally impaired” travelers to have their support animal in the cabin with them, for no fee. There are some requirements regarding doctor letters and equipment, all of which are relatively easy to obtain. The Act covers “all service animals” except certain unusual animals such as snakes, reptiles, rodents, and spiders. So while any animal necessary for the emotional well-being of a passenger are required to be transported, owners of emotional support snakes will be disappointed to find out they’re not allowed to have snakes on a plane. Samuel Jackson will be thrilled.